Anyway, I was fortunate enough to drop by Chinatown the other day and picked up a tub of silken tofu. I never buy tofu from American supermarkets – that stuff is grossly overpriced and often not nearly as fresh as it could be. The pastel green buckets of tofu from the Asian markets are actually distributed by a company right here in Boston, so it’s about as fresh as it gets, and is much cheaper (about $1.65 for 3 squares of tofu). So dinner that night was going to be ma po tofu – a popular Szechuan dish. 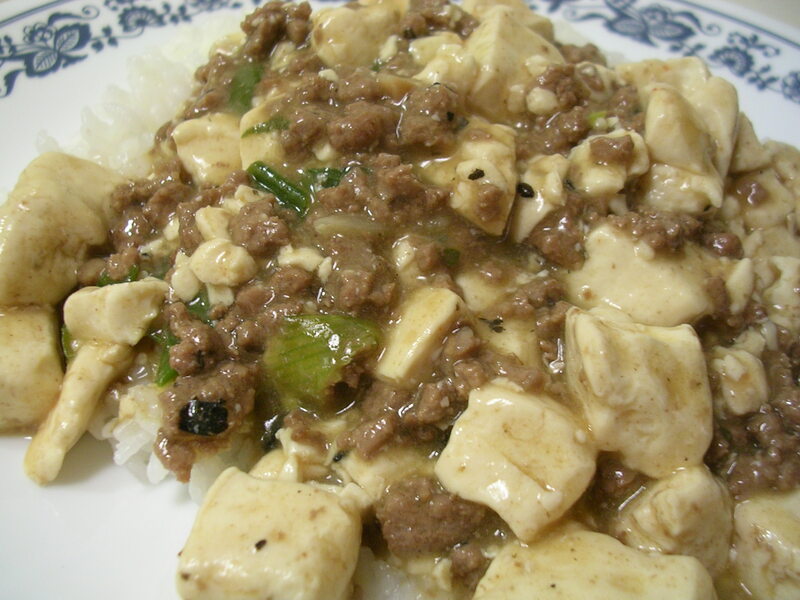 I have never made ma po tofu before, although I’ve eaten it several times. There are so many different versions of the recipe online, ranging from ones that use several handfuls of ingredients, to ones that use less than five. But I figured, if there was going to be a decent recipe, our Communist propaganda cookbook would definitely have it. 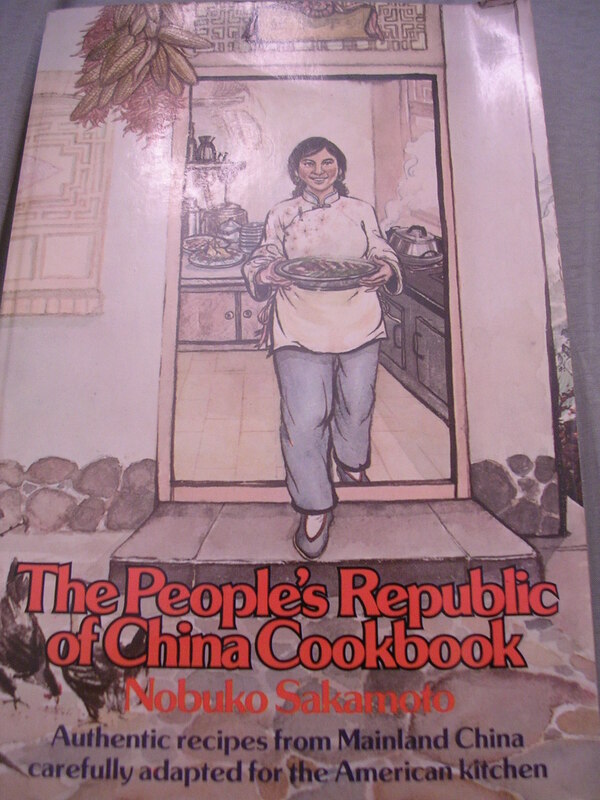 I’ve flipped through it before, and it has an amazing array of very authentic Chinese recipes, many of the dishes being ones that I’ve only eaten at home or in China. It certainly isn’t your Chinese restaurant in America cookbook. And sure enough, there was a good recipe for ma po tofu, with a fair number of ingredients, some of which I didn’t have. Admittedly, it didn’t come out bright orange like many ma po tofu dishes tend to be, but that’s probably because I was missing a lot of the spicy ingredients it called for, and I was fine with that since I’m not fond of spicy anyway. The dish was nice and flavorful nonetheless, and although it could have used a bit more salt, I am trying hard to eat less salt whenever possible these days. I figure, if the food already has the salt in it, then I can’t do anything about it… but if I’m cooking something that’s slightly under-salted but bearable, I am fine with just eating it as is. As important as taste is to me, and as much as salt makes everything taste better, I want to avoid becoming dependent on salt for flavor. I see it happening at home with my parents, because my dad likes everything to have a strong flavor, so the dishes are usually saltier than I would need them to be. They taste great of course, just like salt laden restaurant food tastes great, but my dad has high blood pressure, and it worries me that he indulges in salt despite that, knowingly. That scenario is one that I’d like to avoid in my future. But I digress. Ma po tofu has an interesting story of origin. Nobody can verify its claims, but supposedly there was an old woman with a pockmarked face that lived in a humble home outside the Imperial city way way back during the dynasty era. A father and son were stranded outside the city one night during a rainstorm, and went to her house for shelter. She served them this dish and they liked it so much that they kept coming back to visit her for it and soon other people heard about it and came to visit too, often bringing the ingredients with them so as not to burden her. Ma po, in Chinese, means old woman with pockmarks. So that’s the little tale about this dish hehe. Another theory is that the “ma” in ma po refers to the numbness you feel after eating this normally spicy dish. Who knows where the name really came from? 1. Cut the tofu into 1/2 inch cubes. Place them in a pan and cover with boiling water for about 30 seconds to make them slightly firm (this is also called poaching the tofu – it brings out a brighter flavor and better texture). Drain in a colander. 2. Peel and mince the garlic. Cur the green onions in half lengthwise and slice diagonally into 1/2 inch sections. Heat the stock until it is just starting to boil. 3. Put oil in a wok or skillet over medium heat. When oil begins to smoke, add the ground beef and stir fry vigorously until browned. Add salt and stir. Turn down the heat and add hot bean paste and cayenne. 4. Add the hot stock and tofu to the meat. Simmer for 4 minutes, stirring occasionally. Add garlic and green onions, followed by sesame oil and MSG. Finally, stir in cornstarch mixture and boil until sauce is thickened. 5. Serve with a sprinkle of flower pepper on top, if desired. This entry was posted on Sunday, February 24th, 2008 at 3:21 am	and posted in Chinese, cooking, recipes, Uncategorized. You can follow any responses to this entry through the RSS 2.0 feed. I think I'm going to cook this tomorrow. I'm looking to work tofu into our diet more and this looks really good. I just need the hot bean paste and some stock and i'm good to go. I wonder how different hot bean paste is from black bean paste. Is it the same bean just with hotness added to the paste? Hope it turns out great!